Danny Goldberg is the only Australian to appear in Artnews’s annual list of the world’s top 200 collectors of contemporary art. His modern harbourside home in Sydney’s eastern suburbs is crowded with works by figures such as David Hammons, Rudolf Stingel, Urs Fischer, Danh Vo, and other high-priced superstars you’ve probably never heard of. The fact that such artists are so little known in Australia is one of the things that gets under Goldberg’s skin. He believes there is a huge interest in contemporary art that is not being met by Australia’s public galleries, and he thinks he can fix the problem. There’s nothing ostentatious about the Goldberg residence. It’s modern and filled with light; spacious, but crowded with furniture and artworks. Danny’s wife, Lisa – a serious force in the kitchen – is holding a meeting of her Monday Morning Cooking Club in one corner of the dining area. It’s a family home – a place for kids and conviviality, not a frosty temple for the display of a collection that has grown by almost 600 pieces over the past five years. Every acquisition has a story attached, from visits to artists’ studios, to purchases from art fairs and top-end galleries in New York or London. One wonders if he’s serious. This man has been bitten so hard by the art bug that to stop buying and put his money elsewhere would be like trying to turn around an express train. While he’s happy to spend money on art, Goldberg needs to have a greater goal than simply enriching his trophy cabinet. The trick is to convince everybody else – notably the directors of Australia’s art museums – that he’s concerned with the public, not just himself. Goldberg has a dream. He wants to share his collection with the people of Australia – not merely those in Sydney or Melbourne, but the entire country. He wants the public galleries to share the works, but this goes against their ingrained tendency to compete rather than co-operate. He’s found that instititutions don’t take kindly to a rich collector telling them how they can improve their act. Others would have given up the fight by now but Goldberg is stubborn. He knows he has a good idea and believes museums can’t afford to be aloof when they no longer have the resources to acquire high-priced contemporary work. Goldberg grew up in Dover Heights, the second son of an upper-middle class Jewish family. His father was a GP and his mother, a teacher. Food and art were the family’s ruling passions, and a weekend’s activities would often include a visit to a restaurant and a gallery. With money he’d saved from a summer job in year 11 he bought his first work of art – a painting by Robert Juniper from the Barry Stern Galleries. Two years later he acquired a Tim Storrier. His first international purchase came in May 1993. It was a work on paper by Gerhard Richter, who according to Artnet News has been the world’s most valuable artist in the period from 2011-16, with sales worth more than US $1.65 billion. Not a bad start, but further progress was slow. Goldman estimates he owned only four or five international works until five or six years ago. He had done what so many casual collectors do, ceasing to buy when there was no more room on the walls of his home and office. From this time onward he began to divest himself of his Australian holdings, through donations and occasional sales. He had multiple works by artists such as Bronwyn Oliver, Rosalie Gascoigne and Robert Klippel, but has kept only one of each. The urge to do something for the greater good was not a new departure for Goldberg, who has spent ten years as Chair of Planning at the Jewish Communal Appeal. Now his sights are set on the broader national interest. 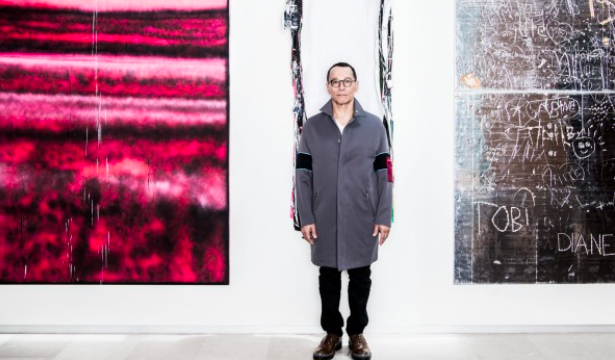 Goldberg’s growing profile as a collector has been recognised in the United States where he is on the boards of the Hirshhorn Museum, Washington DC – which has Australian, Melissa Chiu as director; and MoMA PS1 in New York. When asked which galleries he buys from, he pauses and replies: “Most”. Pressed further, he admits a preference for Buchholz and Gagosian in New York, Sadie Coles in London, and Xavier Hufkens of Brussels. To be a regular customer at the world’s leading commercial galleries means becoming a member of a highly exclusive club. It’s virtually impossible to walk in off the street and simply buy a painting. Goldberg says that even though he started with emerging artists he’s shifted focus to more established figures “because that’s what the Australian museums want to show.” Today he estimates that only 25 per cent of the collection would fall under the “emerging” label. Since January he’s purchased works by four of the biggest names in contemporary art. Having become a valued customer at the über-galleries, the only way one can remain on the books is by constant acquisition. For Goldberg this might mean buying an expensive piece from a set of jpegs sent from New York, trusting in his prior knowledge of an artist’s work. Frustrated by his discussions with museum directors and curators, Goldberg contends that Australian audiences have been “denied the opportunity to see the best the world can offer.” His response has been to sponsor two travelling exhibitions. The first was Stars + Stripes: American Art of the 21st Century, which toured nine Australian regional galleries from October 2014 to November 2016. His next effort is Eurovisions: Contemporary Art from the Goldberg Collection, which will be shown at Sydney’s National Art School Gallery from 2 June – 5 August, before travelling to Heide Museum of Modern Art, Melbourne; Canberra Museum and Art Gallery; and Bathurst Regional Art Gallery. This unorthodox approach allows local curators more autonomy than they usually have with travelling shows. Among the artists likely to be included are Rudolf Stingel, Urs Fischer, Ugo Rondinone, Isa Genzken, Antony Gormley, Katharina Grosse, Sarah Lucas, Wolfgang Tillmans, Danh Vo, Heimo Zobernig, and many others who are wellknown internationally, but only seen in Australia via the Sydney Biennale or Kaldor Public Art Projects. Outside of Eurovisions Goldberg is lending an additional 50 works to be shown at the Art Gallery of NSW, Monash University Museum of Art, and the Art Gallery of South Australia in exhibitions generated by those museums. Since Goldberg first tried to interest the museums in sharing his collection there has been a global trend in favour of so-called “public-private partnerships”, with the flagship being the long-term loan of the Doris and Donald Fisher Collection to San Francisco Museum of Modern Art, in an agreement announced in 2009 and implemented in May 2016, when the institution reopened after a full-scale renovation. Donald Fisher, who made his fortune from clothing retailer, The Gap, had originally suggested a partnership to SFMOMA in 2005, but was turned down. By 2009 the museum had reconsidered, and negotiated a deal with the billionaire shortly before his death later that year. The details are far from transparent, but the term of the loan is 100 years, with many works being gradually gifted to the collection. The Museum’s reopening exhibition featured 260 works from the Fisher Collection, including pieces by Anselm Kiefer, Agnes Martin, Roy Lichtenstein, Willem De Kooning, Philip Guston, Gerhard Richter, and many other big names in American and German post-war art. Choosing his words carefully, Goldberg says the reactions were “interesting”. He didn’t get a strong sense that anyone was particularly keen. In defence of the museums the idea of a public-private partnership with a collector may seem untried and potentially dangerous. Museum directors and curators are a deeply territorial breed who resent any imposition on their own authority when it comes to choosing works. They are also concerned about being perceived to be “adding value” to private collections, although there seem to be plenty of exceptions to this rule. Michael Brand, director of the Art Gallery of NSW, says it’s potentially a great idea but that “its ultimate benefits would depend on the conditions, including costs”. He says he has had a number of discussions with Goldberg over recent years about both gifts and loans, as well as this specific proposal. Apparently not, as the museums have become increasingly unwilling to co-operate over the past decade, partly due to pressure from state governments that insist on exclusivity as a way of cornering the tourist dollar. The upshot of this demand is that art museums are saddled with huge fees and costs that have to be recouped from attendances. But when institutions refuse to share there are less people who get to see an important exhibition, smaller profits, and vastly increased pressures. Nevertheless, because state governments are responsible for the annual budgets of the major galleries it’s entirely predictable that directors will stick with the imperative of putting their own constituencies first. Nick Mitzevich, of the Art Gallery of South Australia, is cited by Goldberg as the director who is most willing to listen and try something new. This is partly because Mitzevich has a painfully small budget from the state government, which means he is obliged to work with private collectors in a more proactive fashion. When I spoke to Mitzevich he praised Goldberg’s generous contribution to the AGSA show Versus Rodin, an innovative blend of modern and contemporary art that draws heavily on important private collections. Typically, Goldberg had gone beyond what was requested, even buying new works for the occasion. Of the 14 pieces he contributed, works by Wolfgang Tillmans, Cecily Brown and Seth Price were acquired for the exhibition. Mitzevich believes the major galleries are gradually coming around to the idea of collaboration under the pressure of budget cuts, increasing costs, efficiency dividends, and the perennial struggle to find private and corporate sponsors. Yet he also thinks Goldberg’s initiative is premature. He can’t see anyone being prepared to put the “national interest” ahead of their own state. It simply doesn’t work like that. Faced with this impasse, Goldberg fired off an email to the Office of the Prime Minister outlining his proposal and the resistance he’d encountered. Three hours later he received a phone call from Malcolm Turnbull, who was intrigued by the idea, and organised a meeting with the Federal Minister for the Arts, Mitch Fifield. The promptness of the response surprised Goldberg, who had met Turnbull only once before, in relation to Jewish communal planning. Given the intractable, factional problems that have plagued the Turnbull government, Goldberg’s proposal must have seemed like a no-brainer. Here was a wealthy businessman willing to lend his entire collection to the art museums of Australia if only they’d agree to share it around. No cost to the taxpayer involved. Not even a tax break for the lender. Goldberg’s mantra in his dealings with the museums and the government is: “It’s not about me.” The grand concept he is now trying to sell is called The Library. Rather than entering into a public-private partnership with a single museum, as the Fishers did with SFMOMA, Goldberg would like Australia’s collectors of international art to join with him to create a ‘library’ of works to be drawn upon by all the major institutions. This was another proposal he put before the AGDC in 2014 which found no favour. There may be only a small number of top-level collectors in Australia but they have amassed significant holdings. Goldberg assumes that, like him, these collectors have more work than can be shown on the walls of their homes and offices, and would like their acquisitions to be seen by a bigger audience. The Library would also act as an encouragement to wealthy Australians who are only beginning to collect art. The concept has an elegant simplicity that must appeal to politicians, who are unwilling to hand over money to the arts when the budget comes under pressure. The scheme is less appealing to museums learning to adjust to a new operating environment in which they need to work more Goldberg has held meetings about The Library with both Brand from the AGNSW and with Senator Fifield. He says the response of the former was “unsatisfactory”. Fifield was more positive, and wanted to hear details of Goldberg’s ideas. The problem, however, is that the Senator’s powers are limited when it comes to the art museums. He can’t force new procedures on the states if they are unwilling to co-operate. The best he could do was refer the matter to his advisors who will analyse the practicalities of the scheme. This means Goldberg is back where he started, having to convince the museum directors, one by one, that he is offering them something of great civic value. He’s even prepared to subsidise storage and insurance costs to neutralise the accusation that he is simply after free accommodation for his collection.